(This article was previously posted before, on the old website, 11/17/2014 14:39, just FYI, this is not a newer review). Following on from my last game related post (from the old website), I forgot to mention that I bought without hesitation, Beamdog's 'Icewind Dale' for my iPad. This is my review which mostly concentrates on the accessibility and nostalgia regarding these games. Readers can find performance reviews with in-depth opinions elsewhere very easily. This is from is more personal, we know these games are great. I spent some digital gold for it because I love older RPG's (mostly for the sprites and top down perspective) and I have always thought ever since the inception of the original iPad, that RPG's games would be a perfect game for such handheld devices. I wasn't wrong when the Baldur's Gate series eventually did come out as its own enhanced edition and I don't feel I'm wrong this time either. The nostalgia has struck twice because of Beamdog. The accessibility is definitely easier than it is on the PC because of the portability and even easier considering the touchscreen we all take for granted. I contain within myself a bit of buzz when carrying these classic adventures with me all day and choose to play them whenever I want, at a doctor's appointment or on the subway. I remember installing these games from multiple CDs and then needing to store them safely. Can't believe we all use to do that, along with returning video tapes and DVDs (some of you already don't do that right?). My level 8 Dragon Disciple, also my first. I never made one in Baldur's Gate. Icewind Dale was first released 14 years, being 20 years old back then meant I grot bored and frustrated quickly after trying to loot the first dungeon and never played it again. Today I am more likely to finish it, I'm already past the first dungeon I quit on all those years ago. 'Icewind Dale II', I enjoyed more, played more, and my method for finishing it, was more of the same meaning I didn't actually finish it. My hope is the sequel is also enhanced later down the line. It's been my fault for not being able to finish these games. I always have this problem with these RPGs, but at the same time I like putting down these games that I can pick up weeks or months later. The accessibility offered has a sharper edge to it than any Swashbuckler's sword! YOU GOTTA ROLL WITH IT. Accompanying the release of IWD are of course the usual comments and criticisms. Some regard the lack of story (there is a story, but whatever), group interaction or no NPC's as weaknesses. I don't, they are a strength in two ways. I'm writing this review from the perspective of somebody who loves the Forgotten Realms and the Baldur's Gate games, but that same somebody who needs a break from all the story quests, the side quests, the character quests and the general management of my party members as and when they start fighting or romancing each other. Compared to the BG series, IWD is far more refreshing at the moment because it is easier to get up and running (no Irenicus dungeon here*). Icewind Dale is on equal terms for character creation, gameplay wise it's a leaner, more linear game so that the mental overhead required is far less than that for BG1 and BG2. A temporary fatigue has set in with the BG games as I'm just in the mood to kick arse with a +3 something, repeatedly (sorry, I don't know what the good weapons are yet in IWD)! Dungeons, dungeons and more dungeons! So many indoor spaces, being outside is rare but a welcome break from the claustrophobia that IWD gives you for the most part. Also because IWD is mostly combat orientated, that actually makes it something far more casual for new comers to take an interest in, this strength is backed up by the new Story Mode (which I have tried when I couldn't get past this particularly hard boss that was a little girl but turned itself into a giant lizard casting magic, sorry i don't know the name) where party members are invulnerable and gain double experience point rewards! This makes me wonder how the Diablo and World of Warcraft games are vastly more popular, it's probably down to their accessibility and arcade mechanics**. 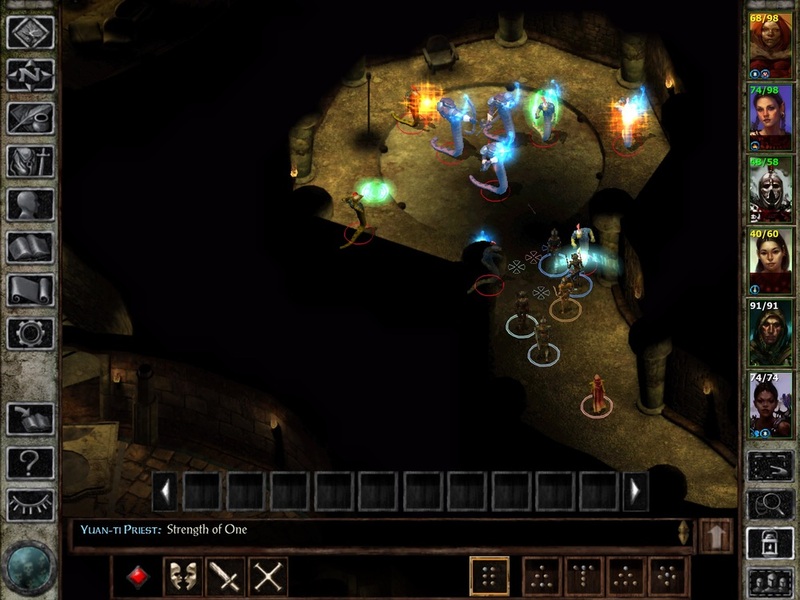 I'm happy for this type of feature as maybe it will get other players into the Forgotten Realms setting as it expands (Trent Oster, the lead developer of Beamdog is on record saying he wants to do Baldur's Gate 5!). *Really wish there was a way to skip that part of the game for seasoned players. ** This makes me wonder why Adam my co-host on JPG Podcast doesn't play any forgotten realms title, but gets engrossed in his Diablo series. Something which I played myself, but I was attracted to the history of the Forgotten Realms and its complexity. I'm a dice chucker at heart rather than a mouse clicker.